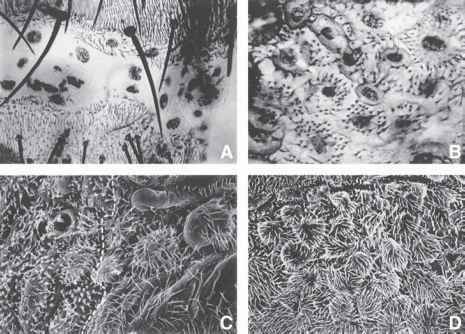 The epidermal cells, a derivative of ectoderm during embryogenesis of insects, contribute to the distinct cuticular pattern and form of the different stages that appear during their ontogeny. The type of cuticular products is the result of gene expression of the individual epidermal cells that lie immediately underneath these outgrowths (1). In hemimetabolous insects, the larval epidermal cells (LECs) present at the time of hatching from the egg and their descendants are responsible for the different cuticular patterns seen in the nymph and adult. 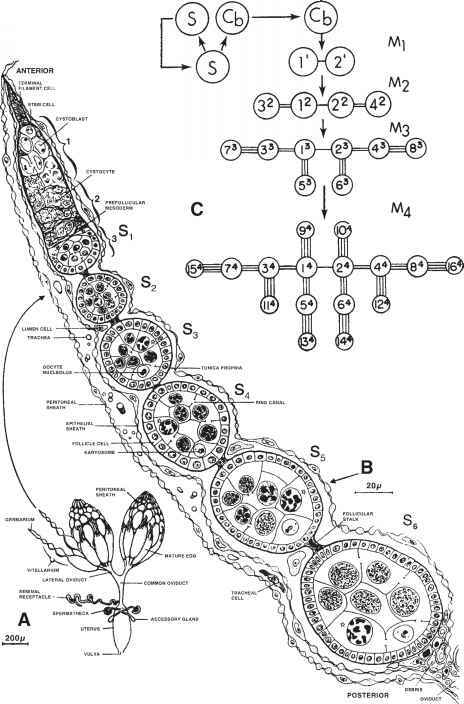 In contrast, in many holometabolous insects, such as Drosophila, the distinct and different cuticular patterns exhibited by the larva and adult have a dual orgin; that of the larva is derived from the LEC and that of the adult is derived from the imaginal discs (2). The prospective integument of the adult head, thorax, genitalia, and analia is derived from imaginal discs (3-5). 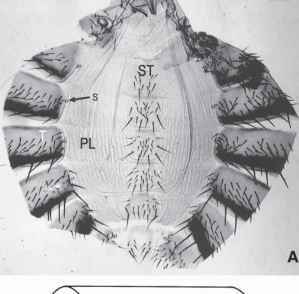 Each of the adult abdominal segments is derived mainly from three pairs of diploid histoblast nests (i.e., a pair of anterior dorsal [ADN], posterior dorsal [PDN] and ventral [VN] nests), located among the polytene LEC of the abdominal segments of the larva (see Figs. 1, 2A-C, and 3A,B). In addition, there is a pair of inconspicuous spiracular nests (SN) in each of the abdominal segments; during metamorphosis these nests (see Fig. 3C) develop into the paired spiracles on the lateral sides of the adult abdominal segment (3,6-9). 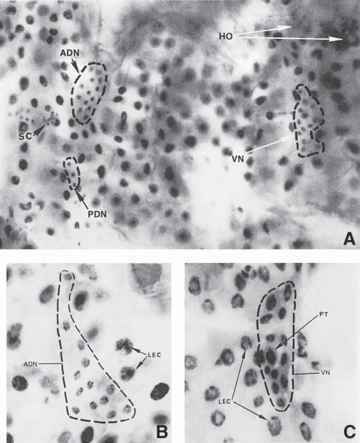 those of the PDN contribute to the intersegmental membrane and the acrotergite (12) respectively (see Fig. 4B). The paired VN give rise to the sternum of the abdominal segments. The sternum contains a median sclerotized patch of cuticle, the sternite, with bristles and hairs, whereas the remaining area, the pleura, contains only hairs. The spiracles derived from the spiracular nests are located contralaterally in the pleura (see Fig. 5A). 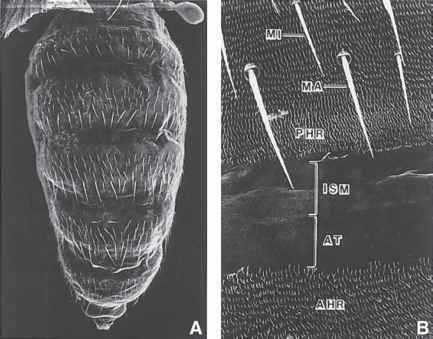 The location of these nests underneath the larval cuticle can be recognized externally in the third instar larvae and early puparia, by their closeness to larval muscle attachment sites, which appear as small depressions on the cuticle (see Fig. 5B). The microscopic hairs, which decorate the tergite, sternite, and pleural regions, show distinct morphological features. The tergite and sternite hairs are long and thin with a narrow base and their shafts appear to arise sharply from the general body cuticle (see Fig. 6A,B). In contrast, the cuticle around the bases of the pleural hairs is membranous and thrown into folds. As a result, these hairs appear broad based (see Fig. 6E). 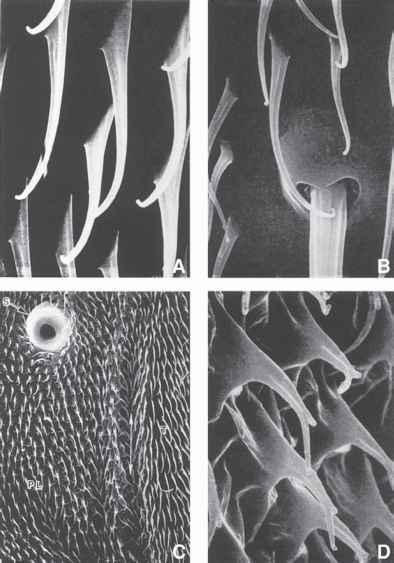 The shaft of the pleural hairs appears forked with unequal arms (see Fig. 6D). histological preparations, compared to the pseudostratified epithelium of imaginal discs. Because there is no muliplication of the LECs or the histoblasts during the entire larval life of Drosophila, the spatial pattern established during late embryonic development is maintained in the larval epidermis. Thus, it is possible to uncouple mitosis from other processes occurring during the 96-h-long larval life. During metamorphosis, the histoblasts divide and begin to replace sequentially the LECs that undergo programmed cell death (apoptosis) (8,10). This facilitates visualization of the sequence of interactions, over a long period, of these two cell types side by side as they occur. We now review the limited number of published studies on histoblasts, which illustrate their suitability for probing many problems in developmental biology. We also indicate where lacunae exist in the nonutilization of this model system for such studies. (hairs) characteristic of their positions in the abdominal segment (see Fig. 7A-D). This indicates that the LEC may contain the blueprint for the adult abdominal cuticlar pattern (13). Whether this information is transmitted to the histoblasts and, if so, how that is done are details yet to be worked out. Formation of the tergite and median sternite by the paired histoblast nests also offers an opportunity to analyze the roles of mitosis, cell growth, cell migration, and cell death in histoblasts in the realization of the final size of these sclerotized cuticular tissues. So far, no studies have been published on these aspects. the role of ecdysones on the dynamics of growth and differentiation of histoblasts, a few studies indicate that juvenile hormone and its synthetic analogs do affect mitosis in them and secretion of adult abdominal cuticle and its outgrowths (14-17). erate genetically marked twin spots to estimate the primordial cell numbers in, and growth dynamics of, different histoblast nests (18). Madhavan and Schneiderman (7) have also studied these features of the histoblasts from his-tological observations and have compared the advantages and disadvantages of these two protocols. More recently, FLP/FRT (see Chapter 17) and SMART (see Chapter 22) methods have been employed to generate mitotic recombination in the imaginal cells. Although extensive studies have been done in the identification of genes, their products and their role in pattern formation, regulation of size, and cell death in the cuticular structures resulting from the imaginal discs of Drosophila, such studies have only just begun in the histoblasts. Madhavan and Madhavan (9) observed that mutation in epidermal growth factor receptor (EGFR), a transmembrane receptor tyrosine kinase (RTK), affects mitosis, spreading and differentiation of adult epidermal cells derived from the various histoblast and spiracular nests (see Figs. 8A-C and 9). Further, the need for EGFR becomes critical after pupation, and the requirement continues throughout pharate adult development for the correct development of the abdominal integument and spiracle. It is reported that Wingless (Wg) determines tergite and sternite cell fates (19,20), and EGFR acts synergistically with Wg (20). Kopp et al. (20) have also shown that Decapentaplegic (DPP) opposes Wg and EGFR signaling, thus promoting pleural fate in the adult abdominal epidermal cells. This explains the wild-type abdominal cuticular pattern observed in the DPP mutant adult flies. The expression of the selector gene engrailed (en) determines the posterior compartment of the tergite (21). Under the influence of en, all cells in the posterior compartment secrete Hedgehog (Hh). This protein enters into the anterior compartment of this segment and that of the following, forms concentration gradients, and at least partly dictates the stereotypic anterior-posterior landscape and affinities of cells of the adult tergite (22-25). The details of what finally controls the polarity of the cuticular outgrowths on the tergum and sternum are still unclear (26). 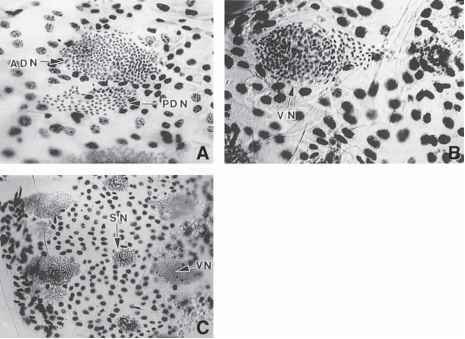 It is possible that the reluctance to apply histological and molecular histo-logical methods to this system could be the result of the difficulty in making planar whole-mount preparations of histoblasts and LECs, and in the identification of the smaller and fewer cells of histoblast nests during larval stages (see Fig. 1) and metamorphosis. We believe that our stepwise description of the methods on whole-mount preparation of the integument during different stages of development of Drosophila will enable the reader to obtain a flat preparation, wherein the location of different histoblast nests and the surrounding LECs can clearly be seen after conventional nuclear and cytoplasmic staining, or specific molecular and immunological staining protocols can be applied for diverse analyses of these two types of cell, during the epigenesis of the abdominal segments.